It’s time for a change, so Dominic packs his collection of hats and his piccolo and heads out, letting the world take him where it may. When Dominic encounters members of the Doomsday Gang, he easily foils their attempt to rob him. 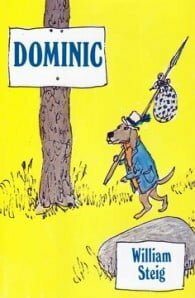 Legend of his victory quickly spreads, and each new friend Dominic meets tells him a story of their own less-fortunate meeting with the villains, and asks for help from the heroic dog. But can one lone dog bring down an entire band of hooligans?